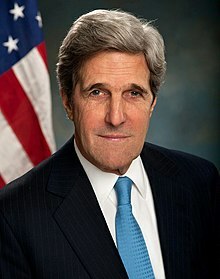 John Forbes Kerry (born December 11, 1943) is a politician, former Massachusetts Senator, Democratic Party's nominee for President in 2004, son of Richard John Kerry and Rosemary Isabel Forbes, husband of Teresa Heinz Kerry. From 2013 to 2017, he served as the 68th United States Secretary of State. We feel we have been used in the worst fashion by the administration of this country. … And we cannot consider ourselves America's best men when we are ashamed of and hated what we were called on to do in Southeast Asia. There are all kinds of atrocities, and I would have to say that, yes, yes, I committed the same kind of atrocities as thousands of other soldiers have committed in that I took part in shootings in free fire zones. I conducted harassment and interdiction fire. I used 50-caliber machine guns, which we were granted and ordered to use, which were our only weapon against people. I took part in search and destroy missions, in the burning of villages. All of this is contrary to the laws of warfare, all of this is contrary to the Geneva Conventions and all of this is ordered as a matter of written established policy by the government of the United States from the top down. And I believe that the men who designed these, the men who designed the free fire zone, the men who ordered us, the men who signed off the air raid strike areas, I think these men, by the letter of the law, the same letter of the law that tried Lieutenant [William] Calley, are war criminals. We must recognize that there is no indication that Saddam Hussein has any intention of relenting. So we have an obligation of enormous consequence, an obligation to guarantee that Saddam Hussein cannot ignore the United Nations. He cannot be permitted to go unobserved and unimpeded toward his horrific objective of amassing a stockpile of weapons of mass destruction. If Saddam Hussein is unwilling to bend to the international community's already existing order, then he will have invited enforcement, even if that enforcement is mostly at the hands of the United States, a right we retain even if the Security Council fails to act. If you don't believe...Saddam Hussein is a threat with nuclear weapons, then you shouldn't vote for me. I said at the time I would have preferred if we had given diplomacy a greater opportunity, but I think it was the right decision to disarm Saddam Hussein, and when the president made the decision, I supported him, and I support the fact that we did disarm him. I voted to hold Saddam Hussein accountable. I knew we had to hold him accountable. There's never been a doubt about that. But I also know that if we had done this with a sufficient number of troops, if we had done this in a globalized way, if we had brought more people to the table, we might have caught Saddam Hussein sooner. We might have had less loss of life. We would be in a stronger position today with respect to what we're doing. We're going to keep pounding. These guys [Bush Administration] are the most crooked, you know, lying group I've ever seen. It's scary. I actually did vote for the $87 billion before I voted against it. … Joe [Biden] and I brought an amendment to the $87 billion, and we said, `This should be paid for now, not adding to the deficit'…. The president said no; the Republicans voted no. America must always be the world's paramount military power, but we can magnify our power through alliances. I'm John Kerry and I'm reporting for duty. It's the wrong war in the wrong place at the wrong time. There is some schedule showing what you (need) to do to get Iraqis standing up and defending themselves which is now suddenly beginning to happen, so there are some signs of progress. We're here to talk about education. But I want to say something before that....You know, education, if you make the most of it and you study hard and you do your homework and you make an effort to be smart, you can do well. If you don't, you get stuck in Iraq. Quoted in "Kerry's 'Botched' Joke Backfires". CBS News/Associated Press. 2006-11-01. Retrieved on 2006-11-01. I'm sick and tired of these despicable Republican attacks that always seem to come from those who never can be found to serve in war, but love to attack those who did. I'm not going to be lectured by a stuffed suit White House mouthpiece standing behind a podium. Quoted in Loven, Jennifer (2006-10-31). "White House spokesman slams Kerry remark". Associated Press (via Yahoo! News). Retrieved on 2006-10-31. KERRY: That‘s not your business. It‘s mine. Are you a Democrat, a Republican? What are you? Are you a registered Republican? KERRY: Are you a Republican? You answer the question. Did you vote for George Bush? Did you vote for George Bush? Quoted in "'Scarborough Country' for March 15". MSNBC. 2004-3-15. Retrieved on 2008-08-07. We have an electorate that doesn't always pay that much attention to what's going on so people are influenced by a simple slogan rather than the facts or truth or what's happening. So my judgment is that Syria will move; Syria will change, as it embraces a legitimate relationship with the United States and the West and economic opportunity that comes with it and the participation that comes with it. Speech at Carnegie Endowment for International Peace, March 16, 2011. What we saw in Syria last week should shock the conscience of the world. It defies any code of morality. Make no mistake, President Obama believes there must be accountability for those who would use the world's most heinous weapons against the world's most vulnerable people. There’s something different about what happened from Charlie Hebdo, and I think everybody would feel that. There was a sort of particularized focus and perhaps even a legitimacy in terms of — not a legitimacy, but a rationale that you could attach yourself to somehow and say, okay, they’re really angry because of this and that. This Friday was absolutely indiscriminate. It wasn’t to aggrieve one particular sense of wrong. It was to terrorize people. It was to attack everything that we do stand for. That’s not an exaggeration. It was to assault all sense of nationhood and nation-state and rule of law and decency, dignity, and just put fear into the community and say, “Here we are.” And for what? What’s the platform? What’s the grievance? That we’re not who they are? They kill people because of who they are and they kill people because of what they believe. And it’s indiscriminate. They kill Shia. They kill Yezidis. They kill Christians. They kill Druze. They kill Ismaili. They kill anybody who isn’t them and doesn’t pledge to be that. And they carry with them the greatest public display of misogyny that I’ve ever seen, not to mention a false claim regarding Islam. It has nothing to do with Islam; it has everything to do with criminality, with terror, with abuse, with psychopathism — I mean, you name it. And that’s why when some people — I even had a member of my own family email me and say, “More bombs aren’t the solution,” they said. Well, in principle, no. In principle, if you can educate and change people and provide jobs and make a difference if that’s what they want, sure. But in this case, that’s not what’s happening. This is just raw terror to set up a caliphate to expand and expand and spread one notion of how you live and who you have to be. That is the antithesis of everything that brought our countries together — why Lafayette came to America to help us find liberty, and all of the evolutions of the struggles of France, the governments, to find the liberte, egalite, fraternite, and make it real in life every day. And all of that peacefulness was shattered in the span of an hour-plus on Friday night when people were going about their normal business. And they purposefully chose a concert, chose restaurants, chose places where people engage in social dialogue and exchange, and they object to that too. So this is not a situation where we have a choice. We have been at war with these guys since last year. President Obama said that very clearly. And every single country — not just in the region, but around the world — is opposed to what they are doing to the norms of human behavior and the standards by which we try to live. Years ago when I left college, I went to war. And I learned in war the price that is paid when diplomacy fails. And I made a decision that if I ever was lucky enough to be in a position to make a difference, I would try to do so. Perhaps the media would do us all a service if they didn't cover it quite as much. People wouldn't know what's going on. "Who among us doesn't like NASCAR?" What Kerry actually said at a campaign rally in Milwaukee was: "There isn't one of us here who doesn't like NASCAR and who isn't a fan." John Kerry had intense supporters of his own. Hollywood filmmaker Michael Moore came out with a so-called documentary that was nothing more than campaign propaganda. In return, Kerry said that Hollywood entertainers conveyed "the heart and soul of our country." This was very unpleasant and surprising for me. We talk to them, and we assume they are decent people, but he is lying and he knows that he is lying. This is sad. Vladimir Putin, as quoted in USA Today, (5 September 2013).